While the rest of the country is getting hit with early winter storms which are bringing huge amounts of snow, down power lines and long cold evenings, central Florida is having some amazing weather. Our mid-80’s temps and calm winds are the norm. Communities up and down the Florida coast are starting to come alive with surfers hitting the waves. But, along with the surf, Fall also the ideal time for Stand Up Paddlers to hit the water. The temperate weather makes for amazing trips through the mangroved lined waterways. Stand up paddlers from Cocoa Beach to Vero Beach are joining the dolphins and pelicans which have now moved back into the Indian River Lagoon. It’s not difficult to see why stand up paddle boarding is the fastest growing sport on the planet. The ability to use the standup paddle board during summer months, winter months, in lakes, rivers and oceans; stand up paddle boarding is proving to be one of the most versatile water sports and recreational activities on the planet. Communities such as Cocoa Beach and Vero Beach have been home for winter surfers looking for big waves, but now those same communities are discovering something new and exciting. It’s not surfing and it’s not kayaking, but it’s the sport which will deliver the acceleration of being out on the water and being one with nature. The ability to be out on the water without complicated motors, heavy kayak equipment or the need to caught waves, stand up paddle boarding delivers the closest connection to nature explorers can achieve. Now that temperatures have dropped, it’s the ideal time to get out and learn how to take part in this amazing new sport. Stand Up Paddle boarding is a great alternative to kayaking which millions are discovering. 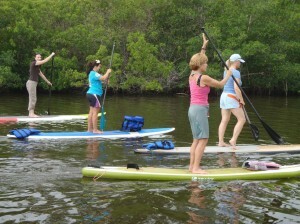 Contact SUP Eco Adventures at www.supecoadventures.com to book your adventure today. This entry was posted on November 4, 2011. It was filed under SUP Blog.